The winter seemed to go on forever. Even though according to the calendar spring had arrived almost a month ago, the woman still felt the cold bite of winter. Snow was still upon the ground and a cold wind blew. She felt as though spring would never get here! I suppose for the sake of this story it is good to give the woman a name though to her it isn’t really necessary, it feels better to give her a name within this story. So for no reason other than I like the name, I will refer to the woman in this story as Rachael. Rachael lives in the mountains of Vermont and her home is in the woods. Most of the time she enjoys the quiet and the seclusion of her home, but sometimes she wishes there were more people around because the days could become lonely; especially in the winter months when the snow made walking around difficult. Rachael loves nature! To her it is the most absolute best thing in the world. She loves the trees, the animals, and the sounds of nature. She even loves the smells of nature, especially in the spring! One of her greatest pleasures is hiking in the woods, going to waterfalls or exploring the woods to find so many treasures of nature to see and enjoy. The cold and the snows of winter make this difficult to do a lot of the time and so for the most part her exercise during the winter comes from walking around her yard. It was during one of her walks around the yard that Rachael found a sign of spring finally coming to her part of the world. As she walked around her yard she saw an area of the ground that had a bit of grass showing instead of snow. Rachael was so excited to actually see the grass that she stopped, knelt down to touch the grass and rejoice in a sign of winter beginning to release its’ hold on nature! As she knelt upon the snow covered grass and reached out to touch the grass she noticed the leaves of a daffodil breaking through the hard, frozen ground. Speaking out loud she said, “Well, will you look at this? A daffodil has broken through the ground! Spring must be on its’ way!” She didn’t feel strange about speaking out loud when there was no one around to hear her but herself because she believed she was never alone, not truly. Rachael believed there are always guardians around her, Spirits of people who once shared the earth and lived their lives, as well as the Spirit of animals, trees and plants. 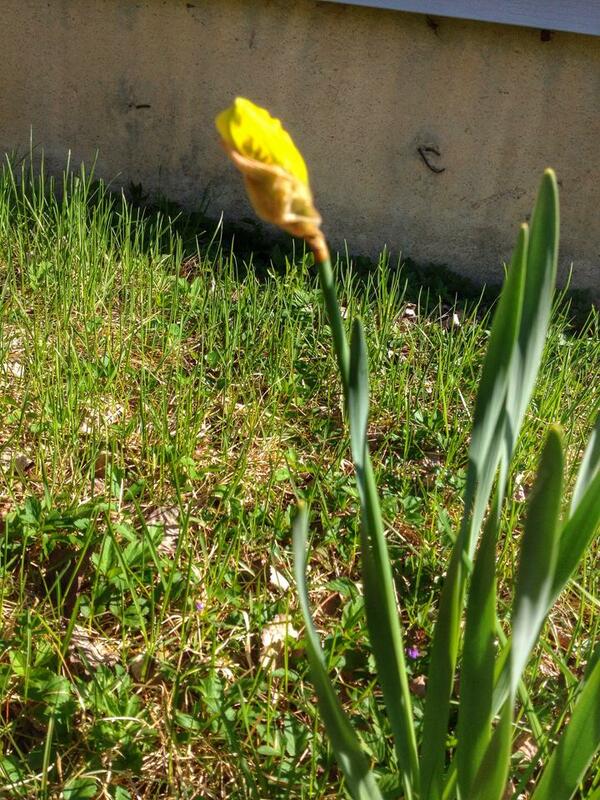 Rachael was so happy to see the leaves of this one single daffodil breaking through the ground! As she knelt there upon the earth she let out a sigh and released tension she had in her shoulders and back. Tension she did not even know was there until it left with her sigh. She stood up, brushed the snow from her knees and continued walking around her yard. If there is one daffodil coming through, there must be more! After she had walked through every part of the yard and even checked within the tree line of the woods around her home she found out there was only the one daffodil breaking through the frozen ground. After she realized there was only the one daffodil and she was unable to find any other signs of spring coming, Rachael went back inside her home. As she came through her door and stepped into her home she sent out a thought of gratitude for the heat she had inside her home. It was still so bitterly cold outside and the warmth of her home felt so nice to her. Rachael fixed a warm drink of hot chocolate and as she sat down to drink her hot chocolate a smile came over her face. She was thinking about the lone daffodil she had found and just the thought of it brought a smile to her face. Every day now when Rachael walked around her yard she made it a point to stop by and check on the daffodil. It was still the only one she found, though she continued to look for others. Last year there had been several daffodils growing in the yard in that same spot, but so far this year there was only the one lone daffodil. Days passed and the leaves of the daffodil grew taller. 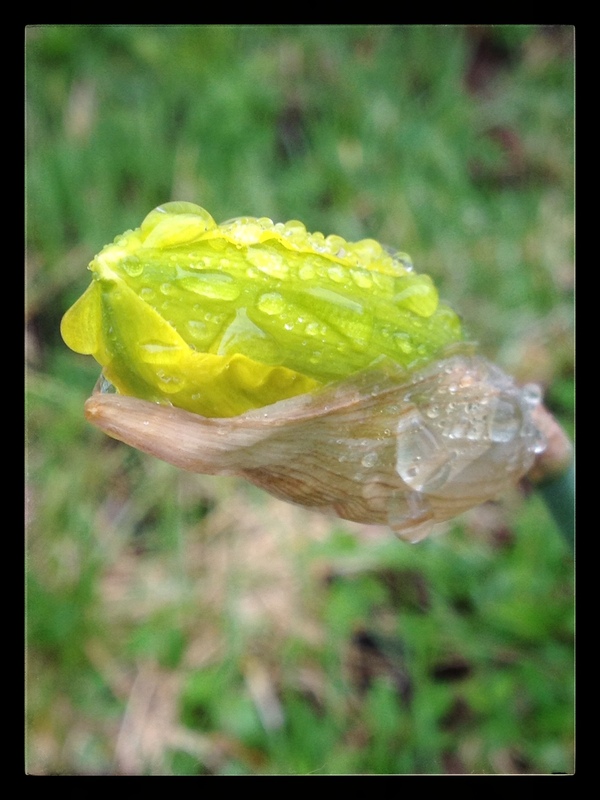 As more days passed she noticed one day the daffodil had a bud on it! Seeing the bud of the daffodil made her so happy! She spoke out loud to the daffodil and told it how much she appreciated seeing it every day. She talked to the daffodil and told it how much she longed for the snows to melt and the warmth of the sun to return. Rachael told the lone daffodil how excited she was to see the bud and could not wait to see it when it bloomed. Weeks passed and eventually the snow did melt. Rain now fell upon the earth instead of snow. Daylight lasted longer and the temperatures began to be warmer. Every day Rachael still walked around her yard. She did eventually find a few other daffodils in other areas of the yard but there was still only the one on the side of her home where the first one broke through the ground. As the weeks passed, Rachael noticed she had begun to become very attached to the lone daffodil. She looked forward every morning after waking up to going outside and checking the progress of the daffodil. She also realized how much time she spent sitting on the ground with this daffodil talking to it as though it was truly able to hear and understand her. From time to time while she was doing this she would laugh at herself. “If anyone would see me doing this little daffodil, they would certainly think I have lost my mind,” she would say to the daffodil. Even though she thought that way about talking out loud to a daffodil she didn’t really care. There was no one around to see and hear except her, the daffodil and whatever guardians and spirits were around. Before long, Rachael was speaking to the daffodil about every part of her life, her beliefs, her hopes, her dreams and her fears. The daffodil continued to grow but the bud never seemed to be any closer to blooming than when it had first appeared. Rachael wondered why didn’t the bud open and the daffodil bloom? The other daffodils in the yard had blossomed already and they had appeared long after the lone daffodil on the side of her home had first broken through the frozen ground. Rachael began to worry about the lone daffodil. “I wonder,” she said to the daffodil one morning, “why aren’t you blooming? You were the first sign of spring and still your bud is held tightly closed, even though the other daffodils have already bloomed.” Now, during her moments spent visiting the lone daffodil she would speak to the daffodil about how beautiful it was and how beautiful its’ flower will be when it blooms. She even sang songs to it and prayed that it would bloom and let its’ beauty be seen. Rachael spent a lot of time thinking about this lone daffodil. She took photographs of it so she could record its’ progress. Day after day it remained as it was; beautiful and green with a yellow bud just waiting to open, but still not blooming. And what was the connection? The lone daffodil was able to break through the frozen ground. Rachael was able to see how often in her life had she overcome seemingly impossible things in her life. Moments and experiences happening that would make it easy to go to bed, give up and wait for life to be over. She did not give up though. She pushed through the obstacles and difficult moments again and again. Like the daffodil, Rachael would lift her face to the sun, soak it in and use its’ warmth to flourish and grow. She would grow and choose to know happiness, to see beauty, to celebrate life and to find peace and contentment in her life. She had hopes, goals and dreams. One of her dreams was to write. As she thought about this she smiled gently and told the daffodil about all the stories she used to write as a child. She would write so many stories and she would illustrate the stories she wrote. Ever since she was a child she loved to write and create stories to share with other people. She remembered all the stories she had inside of her to write down and to share with others. Rachael had allowed things that happened in her life to stop her writing stories. She remembered she had books to write about the things she had learned, the beliefs she held dear to her heart and the teachings she had learned from Spirit. She realized living in the solitude she was living in was for a reason beyond enjoying living in the woods. Rachael remembered how she used to say all the time, “If only I had the time to write, I would write so many books.” With a gentle laugh at herself she told the daffodil, “Well, I definitely have the time to write now don’t I?” Before getting up off the ground to go back inside her home, Rachael reached over and stroked the bud of the daffodil. “Thank you little daffodil for helping me to remember I have many books to write.” Rachael went inside her house feeling confident that because she understood the connection with the lone daffodil that it would bloom very soon! Rachael was surprised to see the daffodil still did not bloom. When she would visit it each morning she would remind the daffodil she got the message and she was beginning to write again. She reminded the daffodil how much she appreciated the message and it was now okay for it to blossom. And yet day after day, the lone daffodil remained as it was with the bud still tightly closed off and no flower showing at all. Rachael felt like crying. She was so upset over the daffodil being buried under piles of dirt, grass and weeds! She knew the young man did not understand how she felt. How could he? He didn’t know how much time she spent with this lone daffodil and what this one flower meant to her. She had told him the daffodil meant a lot to her and he still did not really know how much it meant to her because to him it was just a flower. To her it was so much more! Rachael knelt down on the ground and began to remove the layers of dirt, grass and weeds. As she got closer to the bottom of the pile she began to slowly and very gently remove the dirt. She found a leaf of the daffodil. She brushed the dirt off of it and saw it was still connected to the stem. It had not been broken off. She very gently kept removing dirt until she uncovered the whole daffodil. The stem would not stand up any more. It had been damaged. Gently she built up a supporting wall of dirt around the stem. She dusted off the dirt in the petals of the bud and helped the lone daffodil to stand up again. She softly spoke to the daffodil and told it how it was okay. It could still grow. It could still bloom. Rachael and the young man continued to finish the vegetable garden. When they were finished, Rachael stayed outside with her daffodil. She once again knelt down on the ground and talked to the daffodil. She repeated all she had previously said and encouraged it to grow. She placed a garden ornament of an angel in the garden and told the daffodil she put it there to remind the daffodil that even though it had been hurt it could still bloom. Eventually Rachael went inside and began to cook dinner. Over the next few mornings Rachael spent time with the daffodil. She felt sad as she saw the lone daffodil was not doing so well. The bud began to wither, the edges of the bud began to turn brown and the stem holding the bud began to lose the ability to continue to stand up straight. She would not be embarrassed to know I also tell you she cried tears of sorrow when she saw what was happening to the lone daffodil. Finally the day came when she found the daffodil had died. 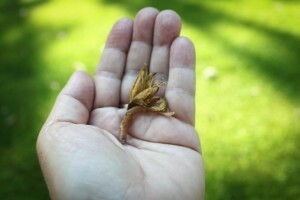 It was fallen over onto the ground, the bud brittle and no longer growing. She gently picked up the bud and brought it inside her home. She sat with the bud in her hands for quite some time, tears streaming down her face. “How foolish am I?” she said. “I am sitting here crying over a dead daffodil.” Even while she heard herself say these words, she also knew deep inside herself the daffodil was much more than just a plant to her. It had been a companion for many weeks. It had taught her to look inside herself again and to see where she had stopped growing within her dreams and goals. She knew even as it died that it still had something to teach her. And so once again she closed her eyes, felt the fragile bud within her hands and listened. As she listened she remembered how many times she had reached towards her goals. She remembered how many times her dreams had been cut short, often by the actions of another person and sometimes even by herself. She knew this time she had a choice to make. Would she allow the experiences of her life to stop her from manifesting her dreams? Would she allow her doubts, worries and fears to stop her from being who she was here to be? She is a writer. And only she can bring that dream into a reality. Only she can write the stories she holds inside of her. She made the choice, right then to write. And she made the choice to keep on writing until all the stories she has to tell are written down. She realized it did not matter if anyone ever read her stories. It did not matter if any of her stories were ever published into books so others could read them. None of that really, truly mattered. What mattered was that she was a writer and it was time to write! She thanked the bud of the lone daffodil again for all it taught her. She thanked it again for reminding her how she had walked away from her dreams and goals. She placed the fragile bud of the lone daffodil upon a shelf with other things that meant a lot to her. She looked at the bud on the shelf next to the other special things she kept there and smiled. Rachael sat down and with a big smile on her face began to write.